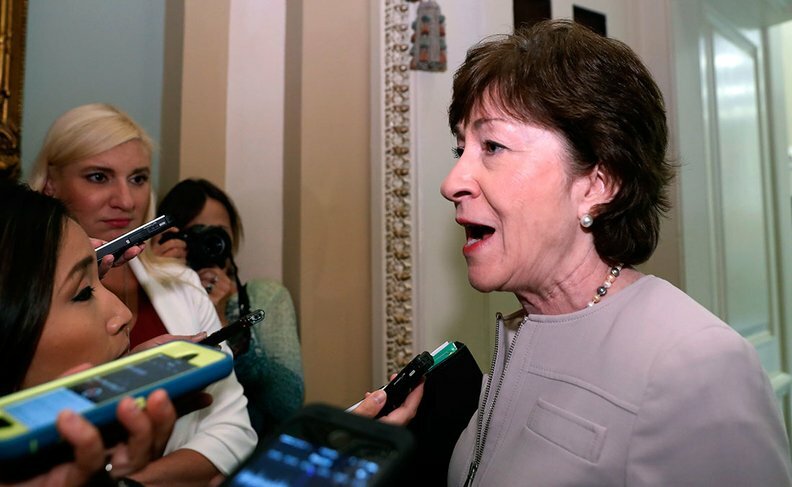 Maine Sen. Susan Collins appeared to deliver the death blow to the latest Senate GOP effort to repeal and replace the Affordable Care Act, announcing Monday she opposes the Graham-Cassidy legislation, calling it "deeply flawed." Arizona Sen. John McCain came out against the bill Friday, and Kentucky Sen. Rand Paul said he couldn't support the revised version released Monday morning because its healthcare block grants are far too large. If Paul sticks to his position, the three no votes would be enough to deny Senate Majority Leader Mitch McConnell the support of the 50 of 52 Senate Republicans he needs to pass the bill under the budget reconciliation process. No Democrats support the bill. The deadline for using that expedited process is Sept. 30. Alaska Sen. Lisa Murkowski, who joined Collins and McCain in killing the previous GOP repeal bill in July, has not yet announced her position. Meanwhile, in a preliminary analysis, the Congressional Budget Office Monday said the revised Graham-Cassidy bill would reduce the number of insured Americans by millions. It also projected the bill would sharply increase premiums for people with pre-existing conditions and shrink availability of coverage for high-cost services such as mental healthcare and expensive prescription drugs. That CBO analysis rebutted arguments Monday by one of the bill's co-authors, Louisiana Sen. Bill Cassidy, that there was language preserving the ACA's protections for people with pre-existing conditions. The CBO also said the bill would lead to major disruptions in the individual insurance market, at least initially, and would force most states to change the ACA's insurance market rules. That would include relaxing requirements that all plans cover an essential benefits package and refrain from basing premiums on enrollees' health status. It predicted many insurers likely would leave the market due to the uncertainty, and that some areas probably would have no carriers selling plans until the new market rules were clear. Federal Medicaid spending would be cut by about $1 trillion from 2017 through 2026, leaving millions fewer people covered, according to the CBO, which said it needed several more weeks to develop a full score for the bill. Funding to the states for the bill's block grants would be about $230 billion less over that period than current law would provide for premium and cost-sharing subsidies and Medicaid expansion, the agency said. The Medicaid cuts were one of the reasons Collins objected to the bill. Over the weekend, the bill's authors had revised the funding formula for its block grants to boost Maine's funding by 43% and Alaska's by hundreds of millions of dollars. "Sweeping reforms to our health care system and to Medicaid can't be done well in a compressed time frame, especially when the actual bill is a moving target," Collins said in a written statement. "The fact that a new version of this bill was released the very week we are supposed to vote compounds the problem." As her statement was released, the Senate Finance Committee was wrapping up the only scheduled hearing on the Graham-Cassidy bill. Democrats repeatedly denounced the rushed, secretive process for developing legislation to radically reshape the healthcare system, while Republicans insisted the bill would improve the system by giving more power and flexibility to the states. The CBO, in its dry language, painted a picture of chaos under the bill, as states scrambled to set up their own coverage systems starting in 2020, when the ACA system of exchanges and premium subsidies would end and the new $1.2 trillion block grant system would start. Pennsylvania Secretary of Health Teresa Miller told the committee that the compressed timeline would not give states enough time to rework their Medicaid programs. States that haven't set up their own exchanges "would have to enact legislation and create a new administrative infrastructure," the CBO said. "A state would not be able to rely on any existing system for verifying eligibility or making payments. It would need to establish a new system for enrolling people in nongroup insurance, verify eligibility for tax credits or other subsidies, certify insurance as eligible for subsidies and ultimately ensure those payments were correct." "Those steps would be challenging, particularly if the state chose to simultaneously change insurance market regulations," CBO noted. Near the end of the Senate Finance Committee hearing, Sen. Ron Wyden, the committee's ranking Democrat, warned that Collins' opposition did not definitively kill the Graham-Cassidy bill. He urged the public to continue working against it until the Sept. 30 budget reconciliation deadline passes. It's unclear if McConnell will push ahead with a vote this week if it looks like he doesn't have the 50 votes he needs. McCain has urged a resumption of the Senate health committee's effort to craft a bipartisan bill to stabilize the individual insurance market, which was derailed by the renewed repeal drive. It appeared that Sen. Lamar Alexander, that committee's chairman, and Sen. Patty Murray, the senior Democrat, were close to an agreement when McConnell squelched that initiative in favor of advancing the Graham-Cassidy bill.